It’s generally not that hard to get a good guitar stand, as long as you’re aware of a few important factors. Let’s take a look at some of the most important things to consider when shopping for a stand for your instrument. Guitar stands can see a lot of wear and tear, so it’s important to go with a model which you can trust to last you a long time – there are a few of those available on the market nowadays, and you’ll have to spend some time searching until you’ve found the right one for yourself. Check the length of the cradle as well, in order to make sure that it can accommodate to different body styles for the guitar itself. 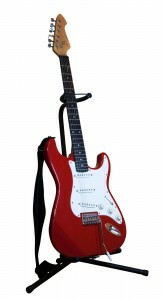 Price is an important factor with anything you’re buying, and it’s certainly not easy to say how you can spot a good deal when you’re shopping for a guitar stand. Generally, just try to stay within a price range that’s reasonable for yourself, and make sure that whatever you’re buying is a durable model that’s more likely to last than something else of the same price (or at least the same general price range). Don’t be fooled into thinking that price equals quality – it’s not rare to find examples of a $20 stand outlasting a $50 model! Does it have a fretboard latch? This is an important feature in ensuring that your guitar will be kept safe when you’re not playing. The stand should have a material overlaying the surfaces, which can protect the finish on the instruments – for example, some higher-class models feature a neoprene-protected body cradle which can greatly complement the glossy finish on your guitar (if it has one, which isn’t very unlikely). Last but not least, the footing on your stand should be made of rubber instead of some material with a low friction level like plastic or metal – this will ensure the stability of your stand when you’re using it. After you’ve built up some experience with the instrument, you’ll likely find yourself investing in more and better guitars – all of them with different configurations and requirements for the perfect playing. This will require a stand that can easily be adjusted to fit those different needs as well, and most high-quality models tend to feature extensive customization settings to allow you to easily fit a guitar of your choice in them without worrying about it fitting properly.